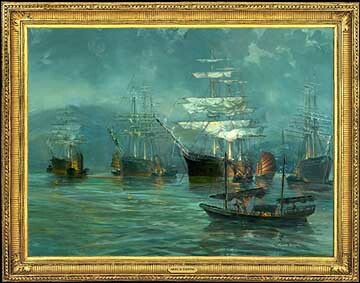 Frame denotes print available as Giclee on canvas In the 1840's, the British Crown eliminated the East India monopoly on China trade. The Asian “gold rush” began for those who could build fast sailing ships to bring fresh tea back to England. The Ariel and Taeping left the Min River at the same time and raced halfway around the world finishing at the London docks within 4 hours of each other in a 99 day race. 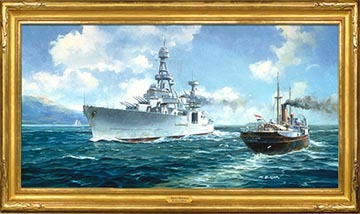 Frame denotes print available as Giclee on canvas The Delta Queen was built in Stockton, CA. in the 1920's. 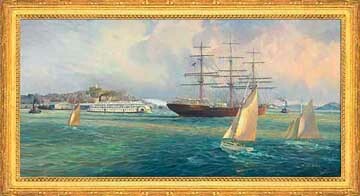 She and her sister ship, the Delta King ran as day/night vessels between Sacramento and San Francisco. In 1946, the Greene family of Cincinnati purchased the Delta Queen, towed her through the Panama Canal up to New Orleans and from there to Cincinnati. 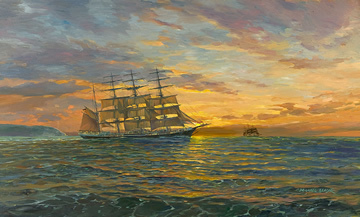 The scene shows the 18th century sailing vessel Balclutha that has been restored and is now the centerpiece for the San Francisco Maritime Museum. The Embarcadero and Coit Tower are shown as they appeared in 1929. When the men of the Horatio harpooned a whale, the carcass was pulled alongside and stripped of its oil skin and underlying fatty layer called blubber. The blubber was chopped by hand into small squares and then more thinly sliced into pieces called bible leaves which were thrown into the pots over the brick triworks and cooked. This simple heating process rendered out the precious oil. These two water colors were part of a series painted while traveling through New England many years ago. Frame denotes print available as Giclee on canvas I have great respect for the literary giant Joseph Conrad. His reoccurring themes of redemption and courage against overwhelming odds, have made his stories of the sea live on through the ages. 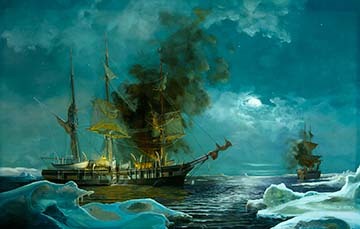 My painting was based on Conrad's short novel - “Shadow Line”. 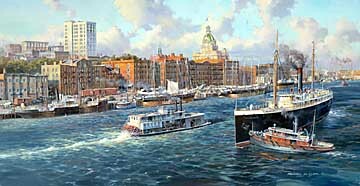 The City of Savannah in 1912 was a sight to behold reaching its zenith of maritime activity. Much of yesterday's grandeur remains today as an architectural masterpiece. 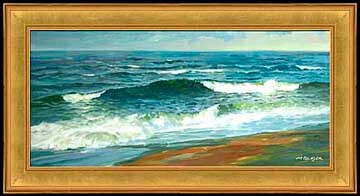 Frame denotes print available as Giclee on canvas The sea has a memorizing effect on most individuals. The tranquil motion and sound of the waves washing ashore can be hypnotic. Ponte Vedra is south of Jacksonville, FL. While on a “busman's holiday”, I stopped by the beach and tried to capture the waves and the reflection of color on the sand as the tide ebbed on a late summer afternoon.